Can the Black Lives Matter movement advance an agenda? Conservatives like Ben Carson have accused them of bullying. Liberals seemingly on their side, like Hillary Clinton, have warned the activists to adopt more of a "positive vision." Even their partners in the push for social justice, like the NAACP, have opted for more pragmatic tactics to changes laws on the books. But the activists in the Black Lives Matter movement say they're aiming for changes more fundamental than policy reform. It's the sort of change that requires some disruption and discomfort -- what John Lewis, the congressman and Civil Rights icon, has called "good trouble." "A successful protest movement has to throw out convention or disassociate with the status quo -- by nature, the protest has to be pushing beyond that," activist Angela Peoples told CBS News. "Throwing out convention and being OK with ruffling some feathers and losing some friends is paramount to this protest movement." 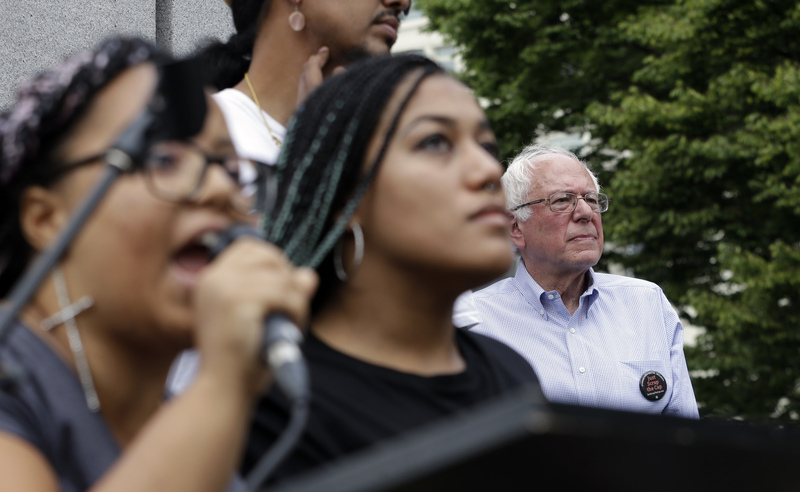 The movement, spurred by the death of 18-year-old Michael Brown in Ferguson, Missouri, has caught the attention of the nation and the 2016 presidential candidates. By recalibrating the national conversation around police misconduct and violence against African Americans and other minorities, the Black Lives Matter movement has already gained ground, activists say. Still, some leaders in the social justice movement want to see the cause move from demonstrating to legislating. That the crux of the NAACP's Journey for Justice, a six-week march that started in Selma, Alabama, the birthplace of the Voting Rights Act. The march culminates in Washington, D.C. on Tuesday. As the marchers made their journey, they focused on a series of issues -- economic inequality in Alabama, education reform in Georgia, criminal justice reform in South Carolina, voting rights in North Carolina and youth engagement in Virginia. It's bringing the full agenda -- including legislative reform proposals -- to federal lawmakers on Tuesday and Wednesday. On the issue of criminal justice reform, the NAACP is specifically pushing for the End Racial Profiling Act, which would define what constitute "racial profiling" and ban the practice nationwide. "Between Washington and Selma we are marching under the theme, the banner... of our lives, our votes, our jobs, and our schools," NAACP president Cornell Brooks told CBS News. "When we say our lives, we're talking about the lives of yes, black people -- but we're not just talking about African-American lives only." The emphasis on black lives is justified, given that young black men are 21 times more likely to lose their lives at the hands of the police than young white men, according to recent FBI data analyzed by ProPublica. Even so, as the NAACP's Born Suspect report showed last year, Muslims, gays and lesbians, young people and others are all subject to racial profiling. "We make the case all lives matter, whether your skin is black or your uniform is blue," Brooks said, "but we're very clear that racial profiling as it exists and as it operates in this country must be brought to an end... The most important thing here is that we bring about fundamental change." While taking a different approach than the Black Lives Matter activists, Brooks says they're working for the same goals. "The issue here is not so much how polite our protesters are, but how responsive our policy makers are." Since its founding in 1909, the NAACP has worked alongside more militant activists, often working on the legal and legislative front while leaders like A. Philip Randolph and Martin Luther King, Jr. staged protests. Brooks said that Black Lives Matter similarly has played a critical role at this juncture of the civil rights movement. Young people mobilizing a movement with simply a hashtag "transported the image of Michael Brown's body on the street around the world in a matter of hours and days," Brooks said. "And as a consequence of their digital advocacy put Michael Brown's name on the lips of Barack Obama in Geneva -- critically important." Angela Peoples, who has participated in multiple protest movements as a Black Lives Matter activist and as co-director of the LGBT rights group GetEqual, said there's room for multiple organizations to move forward with different roles in the push for social justice. "We love an inside-outside strategy -- the idea that we would be the ones that are the pain in the side [of politicians], the ones that are holding the line, uncompromising in a way that is in your face and uncomfortable and disruptive," she said, "especially when there's the other force of that, that's trying also to move more of the traditional levers inside" Washington. Even so, Brooks argued that a protest movement can only go so far without legislative action. He pointed out that the one point of accountability in Ferguson after Michael Brown's death was the release of the Justice Department's pattern or practice investigation -- an investigation that could only be carried out because the NAACP had previously worked with Missouri lawmakers to ensure certain statistics were kept. "If you care enough about the issue to raise awareness, you've got to care enough to take legislative action," he said. Peoples contended that legislation is only "tweaking on the margins" of major social issues that can't be addressed simply through politics. "We don't just want to see candidates that say, 'I hear you, I think that body cameras are important too,'" she said. "We want candidates to say, 'I hear you, Sandra Bland was murdered, and that hurt me, too, and I want answers, too, because I'm a human being.'" It's important to recognize the troubling and perplexing nature of Bland's death in a county jail, Peoples said, because "we know that our political leaders can influence culture." Meanwhile, Peoples said, the disruptive tactics of Black Lives Matter are inspiring a new generation of leaders to step up. "People's instincts is to come to the streets to physically express that frustration" over problems like police violence, she said. "There's a need to give people a place to sort of express that frustration and show that this is an us problem and not a you problem... The ability to shout, to physically, visibly express that... things are not all right, that you are feeling a sense of urgency and emergency, is very empowering."